Location: At the cross-roads in the centre of the village, on the S side. Imposing gateway in castellated style. 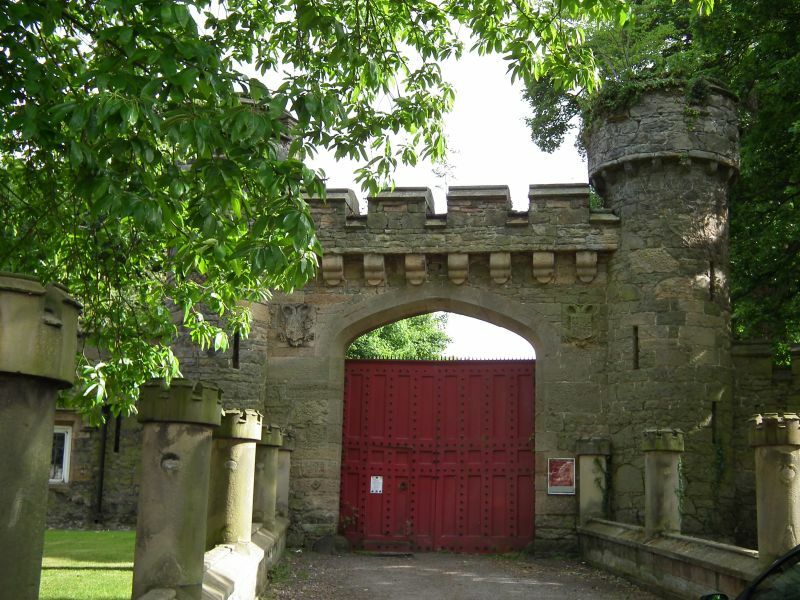 Built by Sir Stephen Richard Glynne II as one of a pair of entrance gates to the new Hawarden Castle, the other located immediately to the E of the house. They are attributed to John Buckler, and the latter one is shown in a water colour by him dated 1819. Of uncoursed sandstone, a large central Gothic archway, chamfered and with false machicolations above. Crenellated parapet carried on moulded brackets and with moulded copings. Diminutive flanking turrets with blind arrow slits and coped, crenellated battlements carried on simple corbels. Inset coats of arms flanking entrance at springing. Contemporary studded and panelled gates. Battlemented curtain walls sweep in an arc to E and W. To the E this terminates in a large shaped gable, which forms the end wall of a terrace of stone cottages (see Nos 4-30 Glynne Way). Two blind slits in the wall and 3 windows. 2 of these are of 2 lights and are leaded, of which one is later. The other is a single light leaded window. To the W a similar stretch of wall runs for approximately 20ft before it returns. A squatter, ashlar wall of similar form and with 3 blind slits continues to the W at this point, and is itself terminated by a similar crenellated turret. Contemporary squat retaining walls encircling banked forecourt. Of stone with regularly spaced, minature crenellated turrets and copings. Listed for its important contribution to the main street, and as a possible work by Buckler. Within the park, behind gateway and abutting to E.
At the cross-roads in the centre of the village, on the S side. Adjoining the Glynne Arms to the E.
At the cross-roads, and situated in the centre of the road.